A green wave has come at last to the cryptocurrency market after weeks of sluggish movement, as the market added nearly $9 billion overnight. Major coins are trading with a double-digit surge against the US dollar and the top-10 saw another major re-shuffle, this time from a bullish wave. The price of LTC currently stands at $43.36, the highest point since before the November hardfork that set-off a market collapse. Speaking of the hardfork, Bitcoin Cash [BCH] is one of the coins overtaken by Litecoin in its sudden surge to the top-fray of the coin ladder, and despite the close race, Bitcoin Cash has also been riding the collective market bullish high and has seen a wave of green. Not quite a 30 percent rise, but BCH has risen by 11 percent against the US dollar and the coin is now priced at $128.31. The market cap of the coin went through a mid-week slump when it dropped below the $2 billion mark but this recent rise has pushed the market cap up by 12.84 percent in the past 24-hours to $2.31 billion, with no signs of slowing down just yet. The other coin overtaken by Litecoin in its rise to the top has been EOS, which the coin leads in terms of market cap by over $170 million following the former’s meteoric rise. EOS has also fared well, with the coin being the second-highest gainer in the top-10 amassing a 15.03 percent rise against the US dollar in the past 24-hours. EOS is priced at $2.73, the highest price-point since the beginning of the year after a month of stagnant movement, which saw the coin’s volatility decline. The market cap of the coin now stands at $2.45 billion, over $180 million ahead of Bitcoin Cash in sixth place. EOS saw a prominent rise earlier in January which saw the coin overtake both BCH and the stablecoin Tether [USDT] to take the fourth spot, which was soon eclipsed by Litecoin. No other coin-shuffle took place in the global coin market but there were other notable price increases. Ethereum [ETH], the second largest altcoin also saw a double-digit rise of over 13 percent against the US dollar as the price rose to $118.6, a price point which the coin fell below only recently in late-January. The market cap of Ethereum is now $12.42 billion, trailing XRP by under $320 million. Closing off the top-10 is TRON [TRX], Stellar Lumens [XLM] and the newbie Binance Coin [BNB]. Tron has been on a constant rise following a slew of developments and their January niTROn summit, the recent increase has pushed the price of the coin up to $0.0271 and the market cap to $1.806 billion. During the previous market reshuffle, Stellar Lumens fell to its lowest point in over 13-months, but the recent rise has pushed its price by 8.05 percent against the US dollar and is now priced at $0.08046 with the market cap at $1.54 billion. 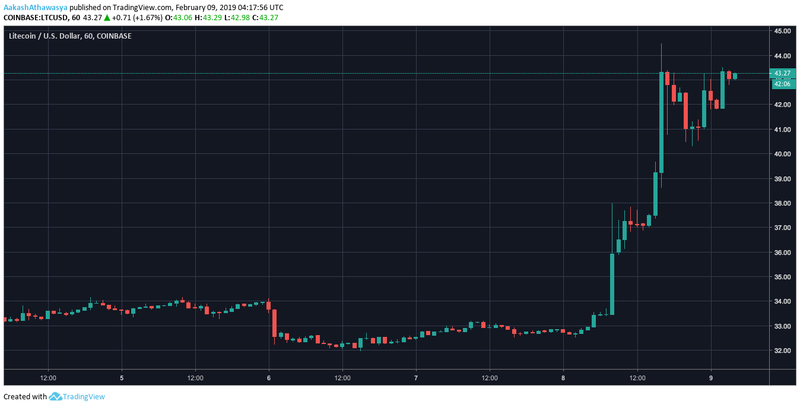 Binance Coin has followed up the mid-week surge that pushed it into the top-10 with another increase, this time pushing up the price by nearly 10 percent to $8.67 and posting a market cap of $1.23 billion, a lead of just over $50 million against Bitcoin SV [BSV] in the eleventh spot. The post Litecoin [LTC] skyrockets by 30 percent; surges into the top-5 past Bitcoin Cash [BCH] and EOS appeared first on AMBCrypto.